2 Hole Scrapbook - with flowers; This is a 2 hole scrapbook with a floral design on the cover. 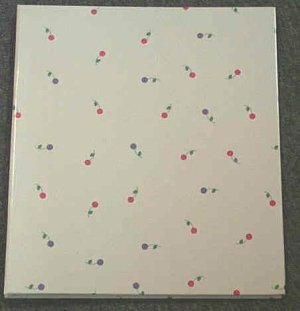 This scrapbook is 10 pages (12 3/8" x 10 3/4") with permanent double sided adhesive stickers to..
2 Hole Scrapbook - with flowers; This is a 2 hole scrapbook with a floral design on the cover. This scrapbook is 10 pages (12 3/8" x 10 3/4") with permanent double sided adhesive stickers to help secure photos or other scrapbooking items. (We have "Memories made easy" - photo displayers also available that fit this scrapbook.) Stickers are also available.